And I'm sure it isn't lost on your daughter that she LOOKS like Dora, right? Playing in the rain is fun! Well captured, I love this photo. What a sweet photo! You can just feel how much fun she's having. Katherine - She was enjoying herself very much. 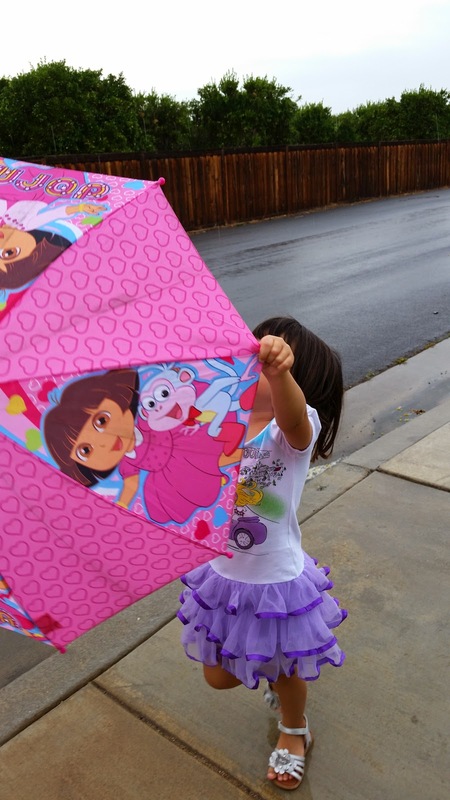 :-) Even though it was raining, she kept turning her umbrella upside down and swinging in around. I couldn't help but laugh along with her. The bright colors really stand out on such a gloomy day, don't they? A tutu and pirouette in all the right colors! Aww! I love that frilly dress. That's the kind of think my younger daughter loves. Looks like she's having fun! NC Sue - She was. :-) She loves being outdoors. Love this! She was having fun! We watched amazing dancing - of a sort last night - genies in the tree tops, mermaids in the sea, firebirds, flying horses - and it was all live at the Double Edge Theater. NO Animation.